A California city has passed an over-reaching law that bans plastic straws in restaurants and slaps violators with a $1,000 fine. 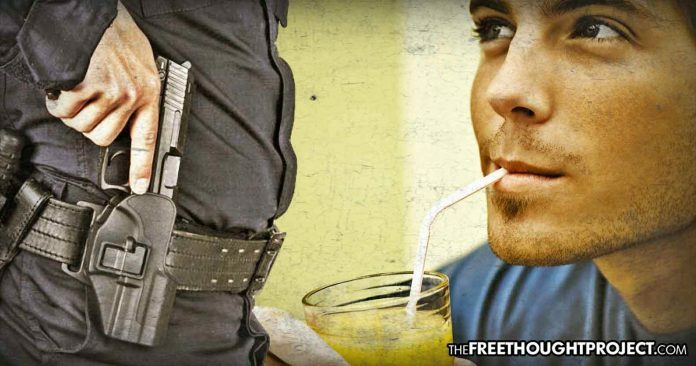 Santa Barbara, CA – Illustrating the growing American police state, the city of Santa Barbara has passed a law that prohibits bars, restaurants, and other food service businesses from distributing plastic straws to their patrons under penalty of jail time and hefty fines. The Santa Barbara City Council on Tuesday unanimously passed what is likely the most punitive ban on plastic straws in the country—but restaurants will still be able to legally give out straws to customers that request them. Santa Barbara… has banned even compostable straws, permitting only drinking tubes made from nonplastic materials such as paper, metal, or bamboo. The city also has made any violation of its straw prohibition both an administrative infraction carrying a $100 fine and a misdemeanor, punishable by a maximum fine of $1,000 and up to six months in jail. Each contraband straw or unsolicited plastic stirrer counts as a separate violation, so fines and jail time could stack up quickly. Unlike other enacted or proposed straw bans, Santa Barbara’s does not include an automatic exemption for the disabled, who often lack the ability to bring cup to lip. Restaurant owners can request an exemption based on medical necessity, but granting one is at the city’s discretion. The Santa Barbara plastic straw ban is largely modeled on a state-level bill introduced by Ian Calderon, the Democratic majority leader in California’s state senate. Nothing Orwellian to see here. In addition to the state legislation, and the Santa Barbara law, the California cities of San Luis Obispo and Davis both passed plastic straw bans last year, and Manhattan Beach maintains a prohibition on all disposable plastics. Santa Barbara Assistant City Attorney Scott Vincent told Reason that criminal charges would only be pursued after repeat violations and other aggravating circumstances, but reserved the right to impose up to the maximum penalties for violators. Research shows that banning plastic straws has marginal environmental benefits, as they only make up a minuscule amount of the total plastic waste. While proponents of the ban spoke of the benefits that future generations would enjoy, no one spoke out for those who could now be legally kidnapped by the state for giving out plastic straws with beverages. The criminalization of otherwise law-abiding citizens, for giving out plastic straws at work, clearly reveals that common sense has left the building. When people are threatened with being locked in cages against their will for handing out plastic straws, you can be certain that we are nearing the realization of an omnipotent police state. As TFTP has previously noted: there are solutions—outside of the police state. And let’s not forget, there is an alternative with massive potential, which is currently prohibited by the federal government: hemp. One of the most useful plants on the planet, hemp has thousands of applications, including making plastic that is biodegradable and non-toxic. Standard plastic is made from petroleum, thus the fossil fuel industry being largely responsible for hemp—a plant that has no psychoactive properties—being criminalized under federal law. Numerous states have legalized or are currently in the process of legalizing the production of industrial hemp, despite the federal prohibition. In fact, last month, the Senate overwhelmingly approved a bill that includes a provision that would legalize the cultivation, processing, and sale of industrial hemp nationwide.